The occasion of a new Tony Hu restaurant opening doesn't always engender the kind of immediate clamorous response it deserves. Last year, for example, the opening of the bizarrely wonderful, Mao Tse-tung themed Lao Hunan was largely ignored by the media for weeks. That doesn't seem to be case with his upcoming River North venture or Lao Ma La, the place he just opened in the old Lure Izakaya space (the seventh Lao restaurant in Hu's empire). 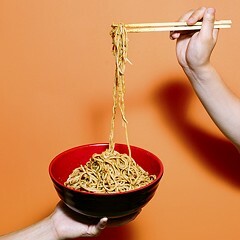 But there's been relatively little talk of his rapid takeover of the great Yunnanese restaurant Spring World. 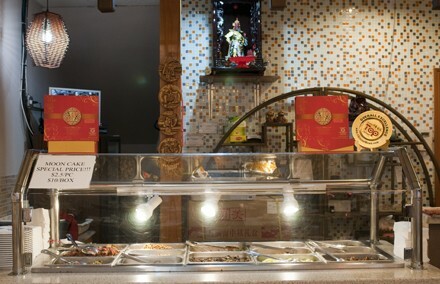 Ever since it was reported that former owner James An's wife had died—resulting in the closing of his hot pot restaurant Tao Ran Ju, and Hu's quick annexation of Spring World into the Lao empire—there's been relatively little data on what's been coming out of the latter's kitchen. Turns out not much has changed—Hu has retained the staff and the chef, though he's hired few more bodies. For years Spring World had been the city's—and one of the country's—only representations of the food of the southwestern Chinese province of Yunnan, which is home to more ethnic minorities than anywhere else in the country. As a result of this diversity, the food of the region, which borders Sichuan province and Tibet, as well as Vietnam, Laos, and Myanmar, is frustratingly difficult for outsiders to get grip on. Lao Yunnan helps in some ways but in others it doesn't. Confusingly, many if not most old favorites from Spring World have been given new names on Hu's menu, which has been jumbled and rearranged—meaning it's not immediately apparent what's different. 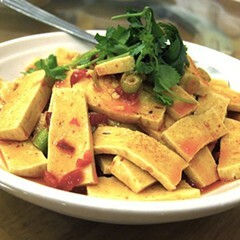 And though there is still a dedicated, expanded Yunnanese section, like most of Hu's Laos restaurants (Lao Sze Chuan, Lao Beijing, Lao Shanghai, and Lao You Ju), it is dauntingly long, with well over 800 items, from Sichuan-style green bean jelly to bear hand bean curd to Chengdu sticky rice balls in wine sauce. For all that you won't find some of the foods Yunnan is most renowned for—no yak broth hot pots, no pu-erh tea, and none of the storied Xuanwei ham used to flavor braises and stir fries. 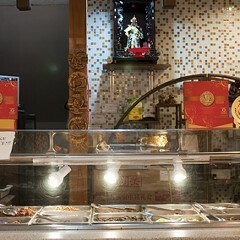 As at most of Hu's restaurants, Sichuanese food is heavily represented. What you will find are plenty of mushrooms. The province is home to more that 800 varieties of edible fungi. Hu imports (as An did before him) ten dried varieties including Boletus edulus—what you might recognize as porcini, but the Chinese call niu gan—and the tiny white species Collybia, or ji zong. 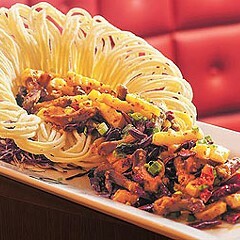 These appear in dishes such as country-style chicken in bamboo, a familiar presentation to fans of Spring World, with silky and ginger-intensive chicken mingling with a great textural variety of fungi served inside a length of bamboo. There's also the beef with Yunnan dry mushrooms, which are sliced thin but still maintain a tensility that fraternizes well with the chewy flesh. One can order these mushrooms, which An touted for their medicinal value, stir-fried with fish, lamb, or slices of smoky Chinese bacon—or roiling in hot pots with duck, fish, or lamb. Little changed after Spring World was reborn as Lao Yunnan. Hu tells me that the most notable difference between Spring World's and Lao Yunnan's menus is the number of fish dishes—particularly whole fish hot pots—that he's added. 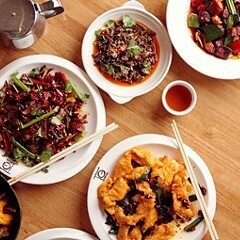 Hot pots are increasingly popular in Chinatown, as at the terrific newcomer Ma Gong La Po, and at Lao Yunnan the varieties include freshwater fish bubbling in an oily brew with mushrooms, sour cabbage and chile, and tofu with Chinese wolfberries. 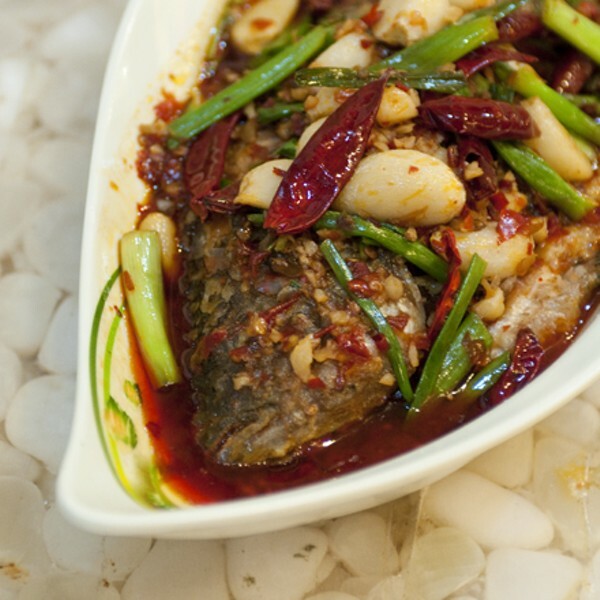 One of Hu's more alluring dishes is the Lao Special Whole Fish—a preparation similar to Ma Gong La Po's "grilled fish hot pot," though not a hot pot at all. Instead, the fish is served bathing in red-hot chile, floating among soft garlic cloves and bright green onions and cilantro. The flesh pulls easily from the bones, silky and sweet. As at Spring World, you can still eat such dishes as nuggets of boneless fried chicken tossed with chiles and nubbins of chewy rice cake, smoky lamb riblets fuming with cuminy vapors, fatty fists of pig feet dubbed "Lao Yunnan special pork hand" and redolent of cinnamon, pasta-like strands of dark green kelp sprinkled with sesame seeds, or cold dishes of soft, spicy eggplant and chewy slices of nearly beefy pig tongue. And of course the most iconic Yunnanese dish remains: Cross-Bridge rice noodles, a pork-and-chicken-broth soup customizable in a variety of ways, with beef or pork tripe and blood cakes. Spring World had a hard-core fan base, but was hardly a household name. And it was an idiosyncratic place, which produced a sensational Ameri-Chinese kung pao chicken in addition to the rare stuff. Lao Yunnan is idiosyncratic as well. At lunch you're likely to see more Chinese diners slurping up the Taiwanese beef noodle soup—niu rou mian—than the Yunnan-style steaming chicken in hot pot. Maybe nobody's buzzing about it because little has changed—and, as a result, Hu's relentless conquest of Chinatown remains benign.